One of the English expressions that puzzles me the most is “easy as pie.” That’s because I don’t see anything easy about making the dough, rolling it out, and mastering the finishing touches that result in a gorgeous pie. 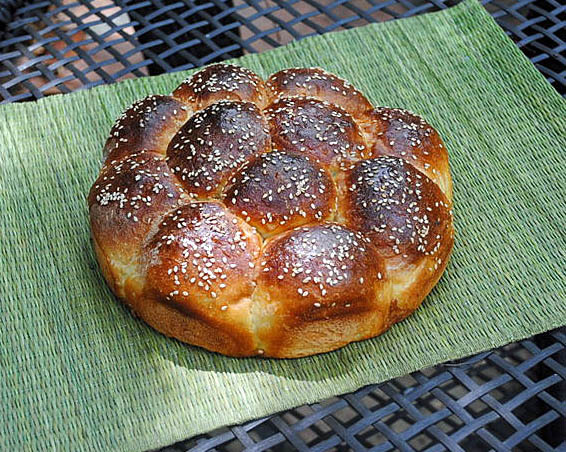 But, I promise that this bread is a cinch to make, and much, much easier than pie! It quickly comes together, so you can wake up on a sunny Sunday morning and make this bread in time for brunch. Combine the flour and salt in a large bowl. Combine the warm water and yeast in a small cup and allow to proof for 5 minutes. Pour the yeast, buttermilk, and honey into the flour mixture and mix to form a shaggy mass. Let the dough rest for 15 minutes, then do a 10-20 seconds kneading. Cover the dough with plastic film, and let it rest for 15 minutes. Repeat the minimal kneading two more times, at 30 and 45 minutes, then let the dough rise for another 45 minutes undisturbed or until almost doubled in size (total bulk fermentation will be about 90 minutes). Divide the dough into 12 to 18 pieces. Shape each piece into a neat ball and place in a round dish or spring-form pan close together. When all of the rolls are in the pan, cover again with plastic and set aside to rise again for 45 minutes to an hour. Meanwhile, preheat the oven to 425. Uncover the rolls and brush gently with the egg wash. Sprinkle on the grain topping. I used sesame seeds. 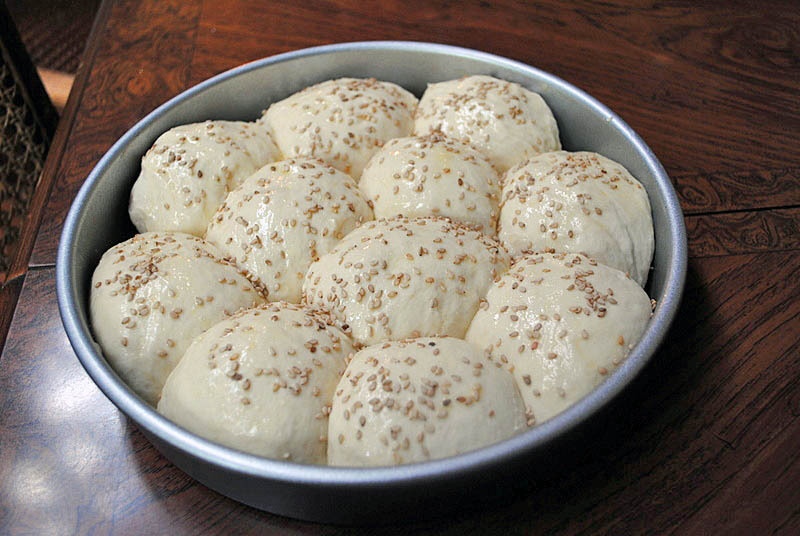 Comments: I didn’t have a springform pan, and my smaller round cake pan could only fit 11 of the dough balls. So, I shaped the leftover dough as a small loaf and baked it separately. 1. I have a double-personality disorder and the “other me” has no self-control. 2. The “other dog” knows how to get the most of those long skinny legs. I guess we know which one it was (sigh). LOL! “Easy as pie” is rather puzzling. Perhaps it refers to eating pie. That’s certainly easy for me. 😉 Actually I’d prefer baking a pie to baking bread any day of the week (not that I don’t love bread). I love making pies – especially in the fall. I’m hopeful that I’ll be able to master and enjoy making bread one of these days too. I may start with this recipe this weekend! Well, maybe we can try to help each other – I am a little terrified of pies, I do them, but don’t feel that comfortable. I was surprised myself, it does feel like only yesterday! These rolls look fantastic! No wonder the sliced loaf disappeared. This recipe is a great idea for Thanksgiving or for, say, tomorrow. 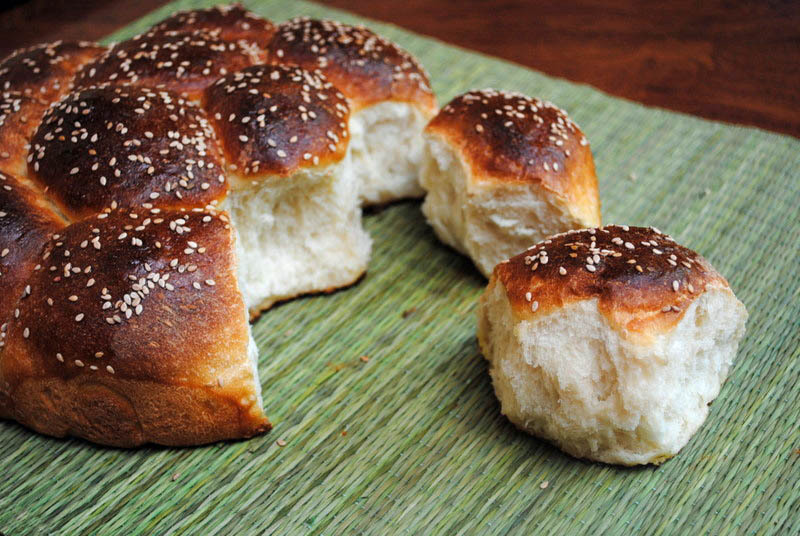 Sometimes a simple, soft roll is all we need… these are truly delicious, all reviews in The Fresh Loaf were stellar! Great looking bread, Sally, as usual! Sally, how gorgeous! I’d like to wake up on a lazy Sunday to that! Well I attempted these today. I think I am just brain blocked or something when it comes to bread. Actually I think I’m doing something wrong with the yeast. I had the same problem that I do when I try my mom’s rolls – the bread doesn’t rise properly. The rolls ended up tasting good, but were dense and I’m guessing not the right consistency. Am I killing the yeast do you think? Going to redeem myself by making a pie crust tomorrow. LOL. Hi Sally. I’ve lurked over here quite a few times but haven’t commented before. This looks lovely. I’m finding any baking with yogurt or buttermilk in it is very agreeable at the moment! Have you tried a sourdough version of the same bread? I’ll definitely be playing with this one.